We wanted a kid. There was the briefest exploration in to fertility assistance but that seemed most likely to result in pregnancy and one of us didn’t want to be pregnant. Then, we said we would only adopt internationally. It took almost two years to come to the reality we couldn’t afford that. We than decided to enter the world of State adoption. We said we only wanted a child who had been terminated legally from their biological parents so we would never have to deal with the uncertainty of losing the kid. In State parlance it is called TPR (termination of parental rights). And – finally, we didn’t want a child with a disability. We ended up with a two-year-old boy with Down syndrome who was not TPR’d at the time we brought him home. Clearly, we knew nothing about anything. I’m a book publicist working on a new published memoir about raising a child with Downs. I would love to send you an advance copy of the book! If you’re interested, would you be able to EMAIL me? As a parent of three month old twins, one of which has DS, I want to thank you. I’m just starting out on this road and I have a lot to learn. I’ve been blogging for years, so naturally I headed to the blogosphere to see what other DS parents are out there. Thank you for your candor, your honesty and for being coherent and well written. We too are not a typical family. This is life, and if you pardon the cliche, it is what it is. I look forward to reading more of you and your wonderful son. First, congrats on your twins! You are right “it is what it is”. What if that was the secret to life? Thanks for the comment – it means a lot. I am so happy for you. So, here we are, almost 2 years later. It still “is what it is”. Of course – it doesn’t sound like you and your family would have it any other way. That’s your gift. I don’t know if it’s the secret to life, but right now it serves as a very useful mantra around here. :) Thanks for the good wishes. What lovely thoughts! I am an author and the proud father of a 38-year-old daughter with Down syndrome. I have written a novel in ebook form, A SPY AT HOME, which is available on Amazon. In this book I have a central character, Noah, who has Down and is adopted. I would like to invite you to read this ebook, and I would be very interested in your thoughts about the story. I can be reached directly at rinald47@gmail.com. Thank you for your blog and for sharing your child with Down syndrome. It’s actually online, livestreamed on our facebook page. Totally free, and all you do is register on http://uclaexlivechat.eventbrite.com/ then go to our facebook Livestream page to “check in” and chat https://www.facebook.com/#!/UCLAExtension?sk=app_142371818162. Also, the program encourages students to live away from home and their parents with other students in their class so they can live more independently and develop the crucial social skills they might miss out on at home. You can submit any questions you might have in advance to livechat@uclaextension.edu, and we will be sure to answer them ! I hope you can join Nov. 16th at 2 p.m. PST. It is so nice to read your blog. Real people:) I have four kiddo’s. My youngest Levi has ds. He is so amazing! Thanks. I like being “real people”. I bet Levi is amazing! Nice that he has a mom who feels that way. Love your blog, and love your directness, humor and insight into living with a superhero! Our “superhero in training” is almost 3 (early indications are that his superpower is freestyle dancing :) His pure joy reminds us daily to forget the nonsense and just DANCE! Life if good! Our genetic counselor, emailed me your article, on how to tell your son that he has Down’s Syndrome. We just got news that our daughter has a different syndrome, and have been struggling on how and when to share it with our kids, and family. This was the best article I could have read! It was perfect, and fit my house just the same! Thank you for your honest writing, and sharing your story. What a beautiful son! I found your blog via linking from Twitter. I love your “warning: this mom swears” badge. May I post it on my blog, too? These are my words, thoughts and ideas strung together. © atypicalson 2009-2013. All Rights Reserved. You probably didn’t see this! Dangit, that blows my dream vision of your badge winnowing out all the mom blogs worth checking out. :-) Anyway, thanks for your lovely writing and contributions to the world. I read your post about adopting a child with down syndrome and it moved me. I have a nephew with down syndrome and he is the most wonderful little boy. You’re right they are not”less than” they are perfect just how they are. Most people only see the challenge of having a child with special needs, they don’t see the reward, the very same reward that every parent has, a beautiful child that loves them. We too adopted a son with Down Syndrome! Love reading your blogs! Kristopher is now 8 and the love of our lives! Through the “powers” of the internet I just read your article on CNN iReport. I was nodding and affirming everything you said. Ours was an international adoption (and therefore we were spared the period of worry that she could be taken away) and in many ways our experience ran parallel to yours. Thank you for sharing. Real and uplifting. Thank you Thorin and family for being such wonderful and funny gems in this crazy world! Deeply saddened by the passing of your dear, sweet Walt. A touching story. Could I recommend a book? Cynthia Rylant’s “Dog Heaven”. My sister gave me this when I had to have my Labrador put down the day after his twelfth birthday due to cancer. She affixed a beautiful dogwood bloom in the front cover. I too am not religious, but spiritual. “God” looks like an Argentinian gaucho in Dog Heaven. It’s a children’s book, but gives me no end of comfort as I miss my best friend. And I am almost 50. Perhaps Thorin will find some small comfort. I loved hearing your story. My daughter has DS and our story is a lot like yours. I fostered her knowing I wanted to adopt. I got her when she was seven months old; she’s five now. I’m a single parent so it’s just the two of us. So many people were negative when they learned about my choice. They forget it’s the happiest time in the world for you. Hello! I don’t know why I didn’t see your comment until now! Thank you! It means a lot. Would you consider sharing your comment as a Amazon and or Good Reads review? It really helps! Hi Kari, Walt and Thorin! 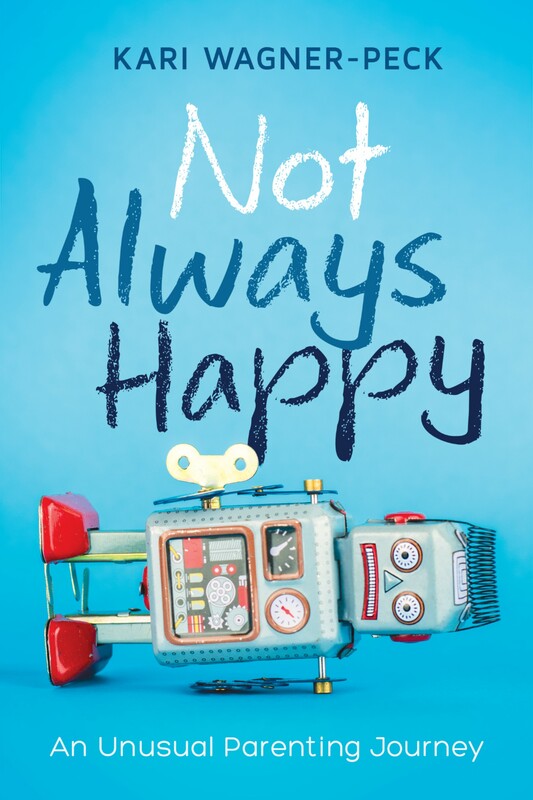 I just wanted you to know I finally took the time to read your book, *Not Always Happy*. Kari, you are an amazing author. I love that your sense of humor shines in the words you write. Because I had many face-to-face conversations with you, I get the humor in your writing even more. The adoption story had me laughing hysterically, although it was a painful and grueling time. When I read pages 222 and 223, I literally started crying. You explained everything perfectly. What parent knows those literacy terms about *key words* and multi-sensory instruction? You captured that moment accurately. I meant it when I said, “Thorin made me a better teacher.” I still use the key words and sign language combination with 2nd graders in BPS. If it wasn’t for Thorin, I never would have included that kinesthetic/ tactile piece into my daily lessons. I believe that the 2nd graders I work with in BPS are enjoying that multi-modal piece and I have Thorin to thank.